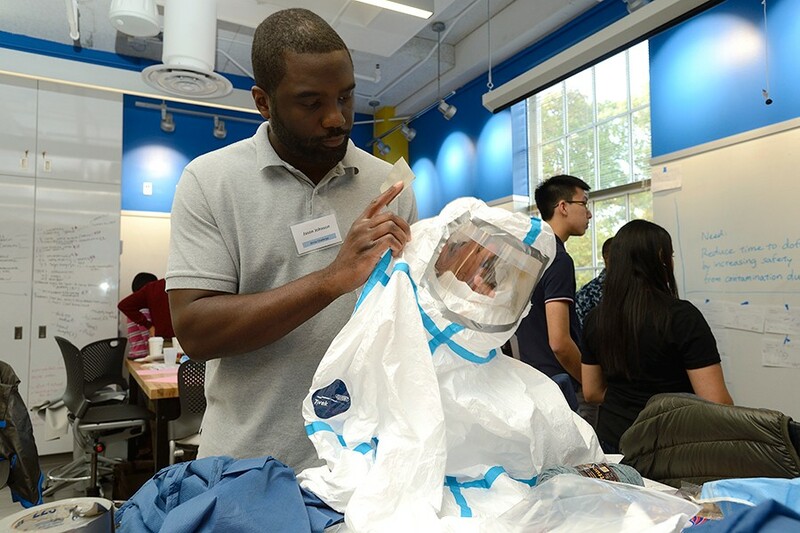 On page 3 of last Saturday’s Washington Post – I was visiting Washington over the weekend – I came across an article headlined, "Johns Hopkins team wins award for improved Ebola suit." The article was modest in length, the smaller of the two stories on page 3, but it was right there in the front of the paper's A section. The article was about a contest, held recently by the U.S. Agency for International Development, to develop a more convenient and comfortable protective suit for people treating Ebola patients (and those with other highly infectious diseases). Readers will remember the complex procedures people needed to go through to get in and out of these moon suits, where some became infected because one part of the procedure was not followed. There were several facts mentioned in the article that make it clear just how attractive a method contests can be to help with public problems. The first was how fast all this happened. USAID launched the contest in early October, and by the beginning of December actual prototypes of the protective suits had been submitted and evaluated by the agency, with winners announced. No lengthy proposals. No need to know the ins and outs of government contracting. Interested participants could devote all their efforts to solving the problem. The article mentioned that these awards were one of several contests recently conducted by USAID, resulting in a total of three awards for various kinds of antiseptic products, for a total $1.7 million. The other two went to three companies I had never heard of (Aquarius GEP, Innovative Biodefense, and SPR Advanced Solutions), so I Googled all three. There wasn’t much information available, but they seem to be a mixture of small for-profit startups and social enterprises, one of which had also been supported by the Gates Foundation. Professor Karim Lakhani of the Harvard Business School has found in his research on contests run by large private corporations that the winners are disproportionately garage businesses and other non-traditional players, about whom the big companies had not even known before the contest. This feature of contests is especially attractive in government, because smaller, non-traditional players are exactly the kind scared away by government contracting rules and special requirements. Contests can be a potent way to attract non-traditional small businesses to help the government find better solutions. There have been a few articles in the mainstream media about using contests to solve public problem since DARPA first launched the idea about a decade ago with its Grand Challenge, but they are few and far between. I blogged recently about how various kinds of “pay for results” arrangements -- of which contests are a prime example -- might be moving toward a tipping point in government. At the Kennedy School this winter we are conducting a junior faculty search in operations management, and the PhD thesis of one of our “short list” candidates is on contests, mainly in a private-sector context but with some government examples. Now the USAID Ebola suit contest has appeared in the Post. Is a tipping point at hand?